Can you answer these 3 simple questions? What is the best seen high-vis colour? Should you remove a biker’s helmet if they have been in an accident? What percentage of accidents occur at junctions? Walking my dog before our Scotland trip in May, it suddenly dawned on me that I had no idea what to do in an accident. Out of nowhere, my mind was flooded with images of Iñigo in the middle of the road, bleeding, the bike flying into an incoming car and me, unable to save his life because I had no idea what to do. In an utter panic, I texted Iñigo that I was petrified and would never forgive myself if something happened to him which could have been prevented with some simple lifesaving skills. Perhaps I was being slightly dramatic but it was a possibility. He replied back: “let’s do the Biker Down! Course”. The Biker Down! course is a FREE course which aims to reduce motorcycle casualties on the road. It is run by the Fire and Rescue Service nationwide and takes just three hours to complete. Bearing all this in mind, it is well worth it to save just one life. After all, as we were told on the day, an injured motorcyclist has to be dealt with in an exact way to avoid causing further injury, particularly when removing a crash helmet. Considering many of us will ride with other people or even in large groups, I see great importance in knowing how to deal with an injured compatriot. We attended the course in Stevenage, Hertfordshire, which was delivered by Tony Smith. Upon arrival, we were greeted with refreshments before filling in a questionnaire where we answered some questions like the ones at the start of this post. I found this rather eye-opening as I realised that I had no idea about simple safety and traffic questions which affect me as a motorcyclist. We then sat down and commenced the day, which was split into 3 modules. This part was by far the most informative or eye-opening for me. Tony spoke us through how to manage a bike crash scene, using the same principles that the Fire Services themselves use. Information on how to protect yourself, which actions to prioritise and what information is required by the emergency services, was covered. In particular, the module stressed how to make use of all the resources available to you at the time. I had never thought about using other people to clear the area and warn oncoming traffic of the accident, nor had I ever considered which angle and where to park my bike if I was to help someone in an accident. These are actions which had never occurred to me or which I thought to be minor until the logic of them was explained to me. Now, it is clear to me that to prevent people crashing into my bike before reaching the scene and thus causing a second accident, you should park your bike at an angle, past the scene on the left hand side of the road. Additionally, I realised that if I came across a biker down who was receiving help, I was still of use, even if it was not on the physical body, because managing the scene is equally as important. Personally, I think this module was my favourite, especially as I learn visually and practicing what I was being taught has made it really stand out in my mind. This module is NOT a First Aid course, but rather compliments such training and further develops skills which are specific to motorcyclist accidents. It teaches how to take care of a casualty and recaps basic life support. Despite being squeamish, I found the tourniquet demonstration and explanation to be of particular interest. Although I knew that these should not be removed, as this allows the body’s toxins to spread into the blood stream and could cause death, I liked the advice of using a marker pen to write a huge ‘T’ on the person’s forehead with the time when the tourniquet had been placed, to inform medical staff of how many drugs or time they had to leave before removing it. It is the small things like that, which I found the course most useful for. Most importantly this module focused on the why, when and how of removing a bikers helmet. Tony explained this in depth to us, expressing we should only help a person so far as we have been trained and see it safe to do. Following an explanation on what our legal obligation in an accident scene is, he demonstrated, step by step, how to remove a person’s helmet using a dummy. We got into groups of 3 and practiced on each other the different roles that each person plays in such a scenario. I thoroughly enjoyed this element of the day and as Tony emphasized, practice makes perfect. Above you can see a video of us practising this. I must stress however, that watching such a video is in NO way training for removing someone’s helmet, but rather, I hope it gives you an insight into what we did during the course in the hope it encourages you to attend. After a second 5 minute break, we launched into module 3. This part focused on how to make ourselves visible to other road users. Although one might think that road users should look out for us bikers, the reality is that it is ridiculously hard to achieve this and so it is much more efficient for bikers to make themselves more visible. The slides showed lights, gear and silhouette shapes that appear to work and those which do not work. It was fascinating to look at photos in gear that I thought would stand out, actually be camouflaged with certain backgrounds and it made me re-think how I could help others see me on the road. Overall, I thought the morning was excellent. The information was delivered in an informative, clear, simple way for everyone to understand. Tony was charismatic and friendly, always happy go through anything again or take questions. I learnt many things on the course and think that I will certainly me updating my knowledge by attending the same course in a few years’ time. Everything I learnt was relevant and life-saving advice which I personally believe any biker should know. It has put me at ease with how to manage an accident scene and reminded me to start everything with 10 deep breaths. If you want to take part in the Biker Down! Course, contact your local organiser and you will be contacted as soon as an event becomes available. 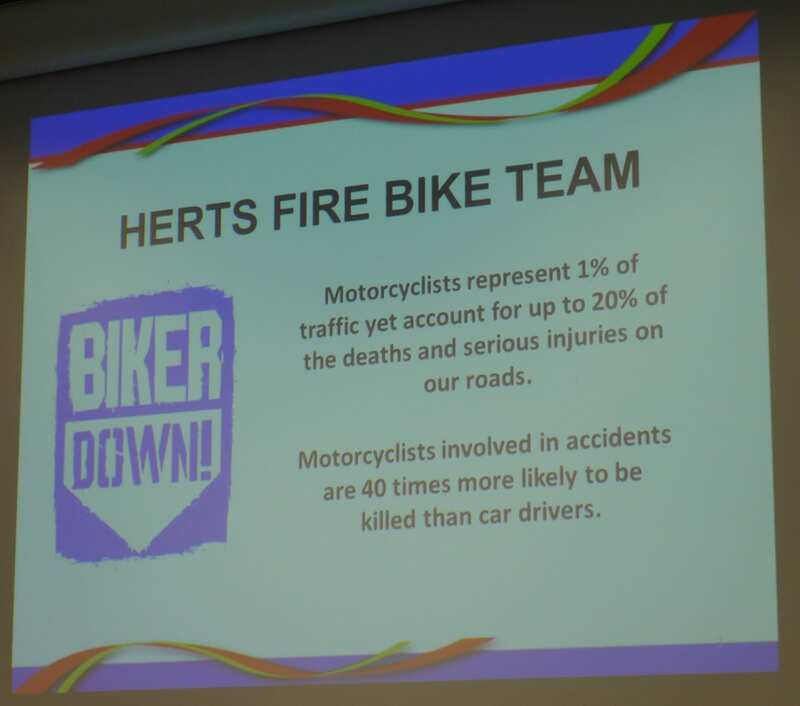 You can also attend as a club or an organisation- I know that after our course Herts & Beds Advanced Motorcyclists (IAM) had organised a ride out with observed rides too, another way to keep safe on the roads!